The king’s men bring Mephibosheth into David’s presence. The frightened man throws aside his crutches and falls down before the king, who has all sovereign rights over his life. Expecting a sword to strike his neck, he hears these unbelievable words of grace from King David. Today, you need to ask yourself what determines your identity. Was it the day you were dropped—or the day you were carried to the King’s table? Dark days will define you no more because you’re in the palace now. If God seems distant and disconnected from your daily struggles…If you feel unworthy of being called a Christian…Or if you’re just not feeling the joy of your relationship with Christ…Then you need a fresh perspective on God that comes through Portrait of God’s Grace. 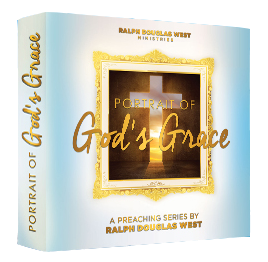 This 5-CD message series from Pastor West will help open your eyes to God’s work in your life as you experience more of His amazing grace.